Not quite two years ago, when I went looking for a horse to buy, I didn’t think that I’d do much more than easy trail rides. I have various physical issues, and was happy to be able to sit on a horse at all. I wanted a horse with a kind eye and a sane mind. I found Tonka. But, if you know me at all, you know that at the heart of my relationships with my animals is communication, and the way that I do that is through training. In my world, training isn’t about dominance, nor teaching a repetoir of tricks. Rather, training opens up a clear dialog so that I can listen to my animals and they can listen to me. That’s especially true with a horse. It turned out that my body could handle more than I thought, and that Tonka is much more than a trail horse. I’ve been a dressage rider for most of my life. 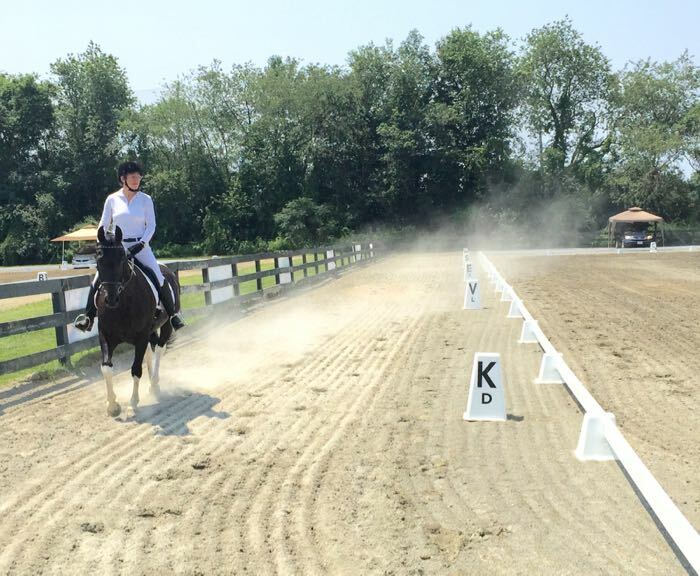 Dressage is all about the gradual, systematic athletic training of the horse so that mount and rider become in sync and can perform intricate movements in concert. That’s the way it should be done. Too often the rider is tense and harsh. and the horse is stressed and miserable – I’ve vowed to avoid that trap. I’m in no rush with Tonka, and don’t want to get up to the upper levels of the sport. I’m focusing on giving him aids that he understands and wants to respond to. We’re both getting fitter so that we can do the movements in a fluid way. So far, so good. At our first recognized show we placed second in our class. Done right, and there’s a sense of accomplishment by the rider and the horse. Here, my instructor, Kim Litwinczak, is telling Tonka what a brilliant boy he is. He knows. One of the the challenges with dressage is that you have to do many repetitions of the exercises both in order to get it right and to build muscles, which is good for the body but not so good for the mind. So, when I heard about something called Versatility Challenge, I decided to try it. It would be different. I hoped it would be fun. A Versatility Challenge is like a trail class on steroids. The organizers come up with things to walk over, though, and interact with. I knew we were going to be doing obstacles that Tonka had never seen, let alone trained on. But, Tonka is level-headed and trusting, and I’ve trained both verbal and physical cues that he listens to. I strapped on my treat bag and off we went. The first challenge we entered had a bar that we had to lift, walk under and replace. That baby pool in the back? It had tennis balls in it. Tonka walked through it. Tonka did everything! He questioned my sanity a couple of times, but I asked him to go forward and when he did, I reached down and fed him a peppermint. What fun! The second challenge that we entered allowed participants to do a walk-through first, which was a good thing, because Tonka had to push a ball. More peppermints! Then we did it mounted. We haven’t quite figured out how to push the ball straight ahead. Points off. Oh well! and cavelettis spaced too tight for Tonka’s trot stride. Tonka had to pick up his hocks. Doing the course was a good mental challenge for both of us, although I think that what Tonka enjoyed the most was getting out and watching something new.